Sam Gravestock puts some German paras through their paces. 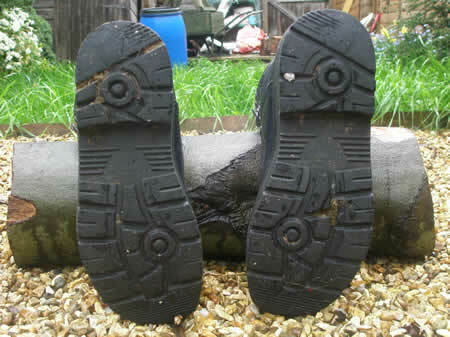 I have had a range of boots for outdoor use in my time. Some exceptional, some erm not so exceptional. I tend to be quite hard wearing on my footwear and I also expect a lot from my boots. I'm not keen on Fabric boots per se and I don't like all-singing all-dancing Gucci boots. I prefer resilient, well thought-out and proven boots. The German Army Para Boots tick all the boxes for these initial criteria. 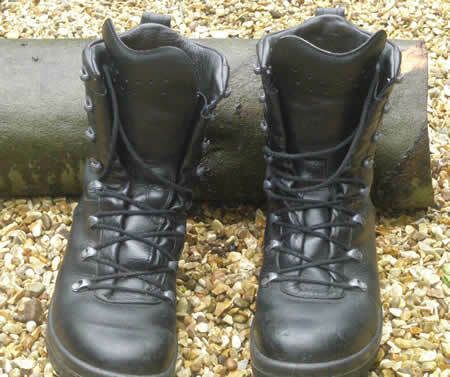 Firstly I must say these are used grade 1 German para boots so they have been issued and are surplus (although Mean and Green do sometimes have brand new German para boots in stock). 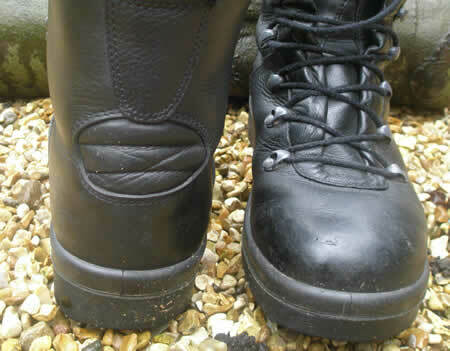 I realise the used boots may be available in a range of conditions, but other than missing one bootlace (a problem quickly solved with an email to mean and green) I could see no visible sign that the boots I received to review had ever been worn. The boots are full leather (black of course), they are mid shin in height, they have three shoe lace holes in the foot area and then five speed lacing loops running from the ankle to the shin. This design feature allows you to decide how high you wish to lace and tie them. It also means you can keep them on your feet loosely but not tie them to the top; this facilitates a quick pull on for strolling for a comfort stop late at night. I found the speed lacing very efficient and speedy (shockingly) - you never know how quickly you might want to get your boots on (or off). The tongue of the boot is sewn completely into the main body of the boot. This prevents dirt/water/sand getting into the boot and causing problems such as blisters or trench foot. Another advantage of the tongue being sewn in place is that it remains where it is meant to be rather than developing a mind of its own, sliding down into the boot and creating a hot spot and rubbing (nothing is more guaranteed to spoil a walk in my view). The German Army Para Boot has an achilles flex panel - a softer part of leather behind the ankle which flexes when the ankle moves which allows for greater comfort and natural movement of the ankle. The boots have pull tabs at the back of the boot to make putting the boots on easier. The grips of the sole are deep and allow a good grip on a range of surfaces - tarmac, sand, mud and leaf litter to name but a few. One thing to bear in mind is that these boots are not waterproof. They are water resistant, not waterproof. This is due to the boots being completely leather without any bells or whistles or magical modern materials, This is not a major issue - you can team them with some waterproof socks or boot liners or make sure you regularly apply boot polish and treat with dubbin or similar. German army Para boots are intended for wearing with thicker socks which is something you may wish to consider size-wise when purchasing. The day these boots arrived they arrived ten minutes before I left for work. Obviously the sensible thing to do would be to wear them indoors, get used to them, break them in etc. etc. So of course I put them on and went to work for an eight hour shift (I am many things, sensible is not necessarily one of them). After eight hours there was the usual relief of taking footwear off after a hectic day but not the agony I had anticipated. So comfortable straight from the start a definite plus (I think this is because the boots are grade one so some other poor unfortunate has had the privilege of breaking them in for me). Next test Distance walking. Something we all know is how a comfortable pair of boots when worn for short time periods or when mooching around town suddenly become two of the most agonising things you have ever had the misfortune to wear when you start to cover some distance. Not so the German army Para boots. They eat up the miles without causing any rubbing points, blisters or any other issues. They are not a light boot by any stretch of the imagination (995g each) but if you wander as I do without a set time and frequent brew breaks the weight is not an issue. Another factor for me is how often I can wear boots - daily, every other day or once in a blue moon. Happily, I have worn these boots every day for a month and they remain as comfortable and weather resistant as the first day I had them. To put it into German as it appears appropriate, das ist gut! You can buy the German Army Para Boots directly from this site in new or used condition.